Supanova II is the newest 'state of the art' charter boat in Weymouth. Skippered by Lyle Stantiford, nothing is too much trouble on board Supanova, If you have no gear, NO PROBLEM. If you've never been fishing before, NO PROBLEM. It's Lyle's aim to offer everybody who steps foot on board Supanova II the best day possible. You can expext as much complimentary tea and coffee as you can handle and a good laugh to boot (normaly at Lyle's expense) and with a bit of luck a few nice fish for the table. Facilities: Toilet for all to use, Microwave, hot water boiler for your tea and coffee, Insulated fish hold. Skipper is more than happy to gut & fillet any fish you wish to take for the table. please do not hesitate to contact me by any means. 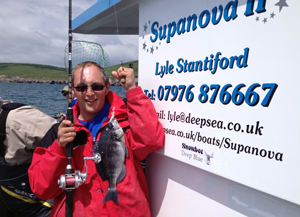 Lyle has been fishing the waters around Weymouth and Portland since the tender age of 5 years old and since then has developed into a well respected young skipper in the port. On leaving school at 16 Lyle joined as crew aboard the famous Weymouth charter boat Tiger Lily skippered by the legendary Chris Caines. Over the next two and a half years Lyle gained masses of experience from Chris and at the age of 17 became the youngest skipper in the country. Lyle went on to gain further experience running Weymouth Charter Boats such as Tiger Lily, Lone Shark, Channel Chieftain, Flamer and Revolution and small stints as a commercial fisherman on various vessels in the Weymouth port. He decided this year to take the leap this year and have a boat built to his own specifications for the purpose of charter fishing / sport fishing. In his spare time you just can't keep him away from boats as Lyle is an active volunteer on Weymouth Lifeboat Crew. Supanova II is now up and running and she is proving a fantastic tool, better than I could ever have imagined in fact! Loads more room, loads more comfort what more could you want? Thanks to everyone for their fantastic support throughout 2016 so far, the diary once agin is looking fantastic for 2017, we have the tides so please express an interest early to avoid disappointment. There are a few trips that you might fancy. A few different things for next year. This will be a series of Sunday competitions where each comp will have a nominated specie to target. The Series will be 8 sundays over the year, competitors are expected to fish all 8 dates if possible with the 6 best scores counting so if you do miss one you can drop that score from your overall total. Only the nominated specie that trip will count and the bigger the specimen the more points you get. There will be £1000 first prize for the top scorer at the end of the year. Other tackle and cash prizes will be up for grabs. Contact me for more details! A good mixed trip, expect to see Pollack, Cod, Ling, Bream, Bass, Turbot, Brill, Tope. Guernsey is a great island in the evening with fantastic pubs and restaurants. This trip is limited to 8 anglers for comfort and space. Cost of the trip including ice and sandals (if available) £465 + accommodation which we can arrange if you wish. Come and enjoy a fantastic break away with like minded people. Are you a specimen hunter looking for 100b Conger?? 30lb + Blonde ray?? 50lb Tope +??? then these 4 days could be for you. All these trips will be limited to a maximum of 8 Anglers. 29th And 30th August will be 12-15hr days in hunt of big congers on the wrecks. 31st August Will be Blonde Ray fishing in the hunt for A British Record, 1st Sept will be fishing in the Deep Hole off portland, Congers, Huss, Tope big Bream!! Get in touch for more details and discounts for fishing all 4 days!! Thanks to all for their continued support and look forward to seeing you soon!! !